Charles Darwin in his most famous work, surprisingly, almost didn't mention the fossil mammals that he collected in South America, apart from brief references in the introduction. "WHEN on board HMS 'Beagle,' as naturalist, I was much struck with certain facts in the distribution of the inhabitants of South America, and in the geological relations of the present to the past inhabitants of that continent. These facts seemed to me to throw some light on the origin of species-that mystery of mysteries, as it has been called by one of our greatest philosophers." Fig.1. 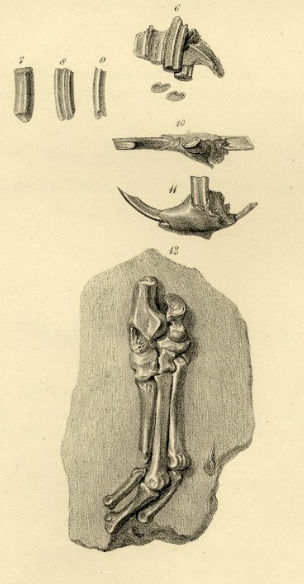 Fossil bones that Darwin attributed to a small rodent mammal - form the formation of Monte Hermoso in Argentina (Pliocene), from DARWIN (ed), 1838, Fossil Mammalia Pl XXXII. During the first years of his voyage aboard the HMS Beagle, Charles Darwin collected a considerable number of mammalian fossils from different localities in Argentina and Uruguay. He recovered his first fossil at Punta Alta September 23, 1832, and the last in 1834 at Puerto San Julián. The fossils were then sent to England to his former mentor - the botanist / geologist John Stevens Henslow, and deposited in the Royal College of Surgeons at London, where in 1837 to 1845 the bones were studied and classified by the famous palaeontologist Richard Owen. On the basis of this fossil material Owen will describe a rich variety of mammals of the Pleistocene of South America, including Equus curvidens, Glossotherium sp. Macrauchenia patachon, Mylodon darwini, Scelidotherium leptocephalum and the strange Toxodon platensis. Unfortunately in April of 1941 the paleontological collection of the Royal College was severely damaged by an air attack, nearly 95% of the collection was lost. Since 1946 the remaining material was transferred to the Natural History Museum in London, where it is still housed. "On the banks of the river Carcarania ... there are a large number of bones of extraordinary size, which seem human." Only 32 years later the French naturalist George Cuvier will publish the first scientific publication on a fossil mammal of South America, the giant sloth Megatherium americanum, followed in 1806 by the description of the genus Mastodon. "It may be expected that the description of the osseous remains of extinct Mammalia, which rank amongst the most interesting results of Mr. Darwin's researches in South America, should be preceded by some account of the fossil mammiferous animals which have been previously discovered in that Continent. The results of such a retrospect are, however, necessarily comprised in a very brief statement; for the South American relics of extinct Mammalia, hitherto described, are limited, so far as I know, to three species of Mastodon, and the gigantic Megatherium." Fig.2. 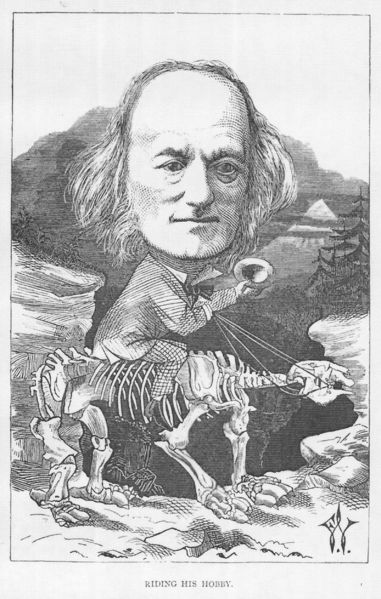 Frederick Waddy: Richard Owen "Riding His Hobby" (1873). The young and inexperienced Darwin identified many of the recovered bones wrong. He attributed discovered bone plates (osteoderms) to Megatherium, following the reconstruction by Cuvier of the animal as an armoured sloth; Owen later attributed the fossils to be part of the giant "armadillo" species Glyptodon. The molars of Toxodon were interpreted by Darwin as the remains of a giant rodent, but even Owen later admitted that these teeth display a certain similarity to those of rodents (in fact there is a bit of truth in Darwin errors, Toxodon is now considered a peculiar form of South American ungulates, a group distant related to rodents). But also Owen made mistakes, he misinterpreted the relationships of these fossil mammals to modern animals, attributing them or implying to them a close connection with certain animal groups still existing. Influenced by the proposed classification by Owen, Darwin summarizes that "The most important result of these findings is the confirmation of the law that existing animals have a close relationship with extinct species" (1839), an additional clue for Darwin that species are not isolated entities in time. During the second half of the 19th century it could no longer denied that species could become extinct, however the much greater problem aroused how these extinctions occur and how after such an event the planet got repopulated. Darwin during his voyage on the Beagle, even before the formulation of his theory of transmutation, wondered if species may die and are reborn in a continuous natural process (excluding a divine creation), an idea which was also suggested by the Italian geologist Giovanni Battista Brocchi in 1814 (proving once again the profound change of thinking in those decades). Observing fossils similar to bones of the modern Mara (Dolichotis patagonum), a South American rodent that resembles a small deer, Darwin realized that species were replaced in time by similar forms (Owen will determine these fossils belonging to a relative of today's tucutucu or tuco-tuco, a small rodent of the genus Ctenomys). However, these subsequent forms remain concrete entities in space and time. For example, referring to the Warra, the endemic fox species that Darwin could still encounter on the Falkland Islands, in 1834 he still consider it " …indisputable proof of its individuality as a species… ". Fig.3. The three possible relationships of fossil to modern species as seen by Darwin during his voyage in 1832 to 1835. 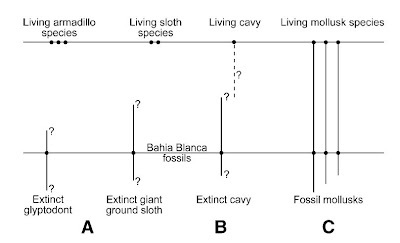 In case A , a species goes extinct and is replaced by an "different", recent species, as for example the giant sloth is replaced by modern sloths, so the Glyptodont by the modern armadillo. For molluscs (case C) Darwin observed a continuum of species that persist through geological time. 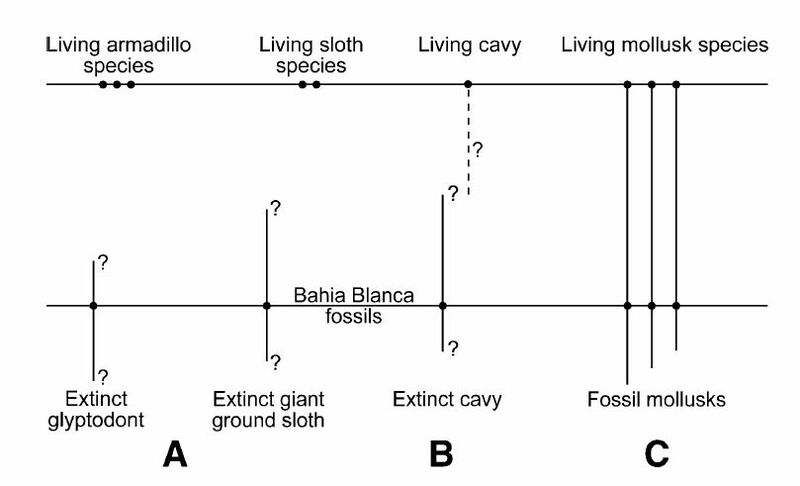 The case B is an intermediate version of the first two cases, the fossil remains of the peculiar South American rodents - species are found in distinct geological layers, however showing also a continuum of species, maybe even leading to species still living today (after ELDREGE 2008). Darwin in a first attempt tried to reconcile the view of species as concrete entities with the observed replacement in time by a sudden transmutation - species could give "birth" to a new species within a short time by a transmutation jump. However influenced by Lyell's uniformtarism Darwin soon adopted, and in end published, a much more gradual model. Apparent jumps in the species of different formations were according to the new model an artefact caused by the "imperfection of the geological record" (Chapter IX). This consideration was not new, Lamarck, who considered single "species-lines" mutable, proposed that the discrete limits between species are the artefacts of incomplete preservation of transitional forms during the act of fossilization. DARWIN, C. R. ed. (1840): Fossil Mammalia Part 1 No. 4 of The zoology of the voyage of H.M.S. Beagle. By Richard Owen. Edited and superintended by Charles Darwin. London: Smith Elder and Co.